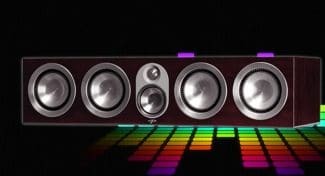 Welcome to our best computer speakers buying guide where we explore some of the best computer speakers available right now based on value for money, real world performance and and consumer feedback. 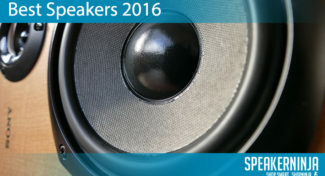 We at SpeakerNinja have taken the time to find various computer speakers that we think are practical and useful in the home or office environment. The audio quality generally ranges from pretty mediocre to exceptional with some of the systems, but this is usually price dependent, with the pricier speaker systems delivering a better overall performance. We have looked at both 2.0 speaker systems (which consists of two speakers without an added subwoofer) and 2.1 speaker systems (both speakers and a subwoofer) to make it a tad easier for you to choose a speaker system for your particular needs. We hope this guide gives you enough insight to make you comfortable with your speaker choice. We also recommend checking out this article on how to equalize your computer for various media players, which could help improve your overall listening experience. 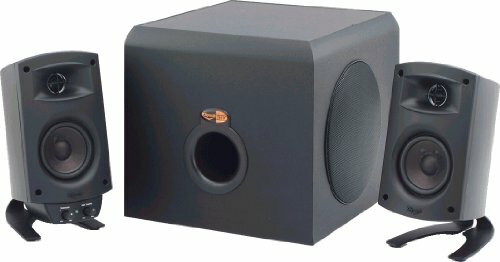 The Logitech Z313 computer speakers are well priced and deliver a decent performance for the price. 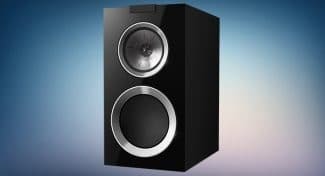 Their dedicated subwoofer packs a decent punch, while the 25 watt RMS satellites pump out decent mid and treble frequencies, although some have described the treble as needing a bit of equalizing due to their rather flat response. Users found them easy to set up, with one needing to simply plug the speakers into the subwoofer, followed by plugging subwoofer into the computer. Some did find that the wiring looked a bit messy at the back, however. They come with an control pod that allows you to switch them on or off and to control the volume of the speakers and they also have a built-in headphone headphone jack for more private listening sessions. The 2.1 system was also found to small and light, not taking up much desk space and easy to move around. 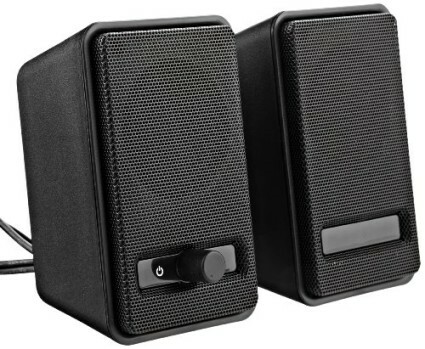 The Logitech Z313 computer speakers are a step up from stock laptop speakers, offering a fuller sound at an affordable price. 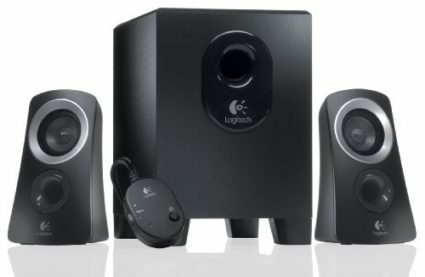 The Logitech Z313 computer speakers deliver a decent overall audio experience for the price tag, but the mid and treble frequencies may sound flat to the more experienced ears. 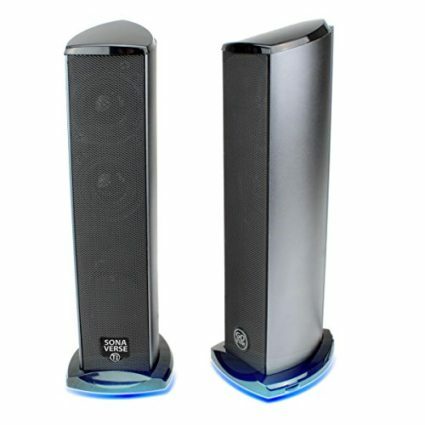 The Cyber Acoustics CA-3602FFP is a basic desktop computer 2.1 speaker system that would satisfy the audio requirements of most looking for decent sound for games, casual music listening and movie/series watching on their computers. It comes with an 5.25 inch subwoofer, which offer a very boomy, rich bass. There were however mentions that the lower bass notes may be slightly cut off. The two satellite speaker are also reportedly quite tinny sounding for some users. These basic 2.1 speakers definitely fulfill their function as desktop speakers and the the separate control pod with its 6ft cable makes the master volume and bass control really accessibly. There is also a headphone jack on the control pod, along with an auxiliary input, making it that much more handy. 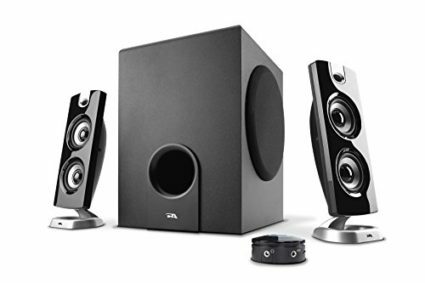 The Cyber Acoustics CA-3602FFP is a great budget desktop 2.1 speaker system that will satisfy the needs of most users looking for an easy to use, basic speaker system. 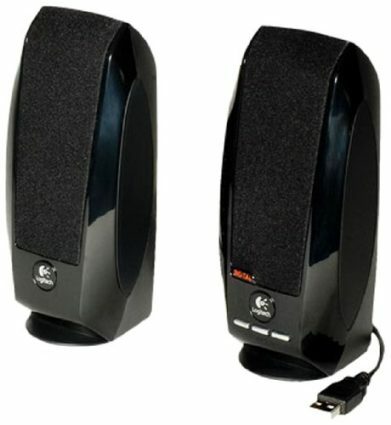 The Cyber Acoustics CA-3602FFP are a very basic desktop computer speaker that fulfills its purpose. It does not offer anything mind-blowing in terms of audio quality, but is easy to use, well priced and does provide one with audible sound that can still be enjoyable. 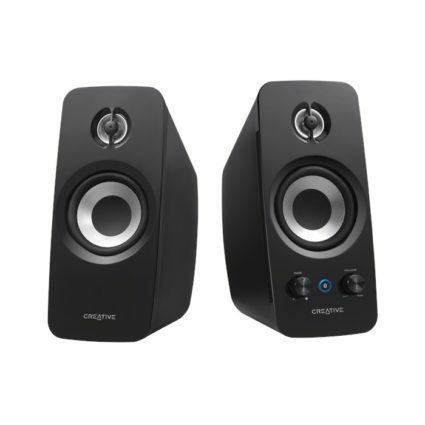 The Creative Inspire T12 desktop computer speakers offer an overall great performance at an excellent price. They are neatly designed and their BassFlex Design give it a nice bit of extra bass. 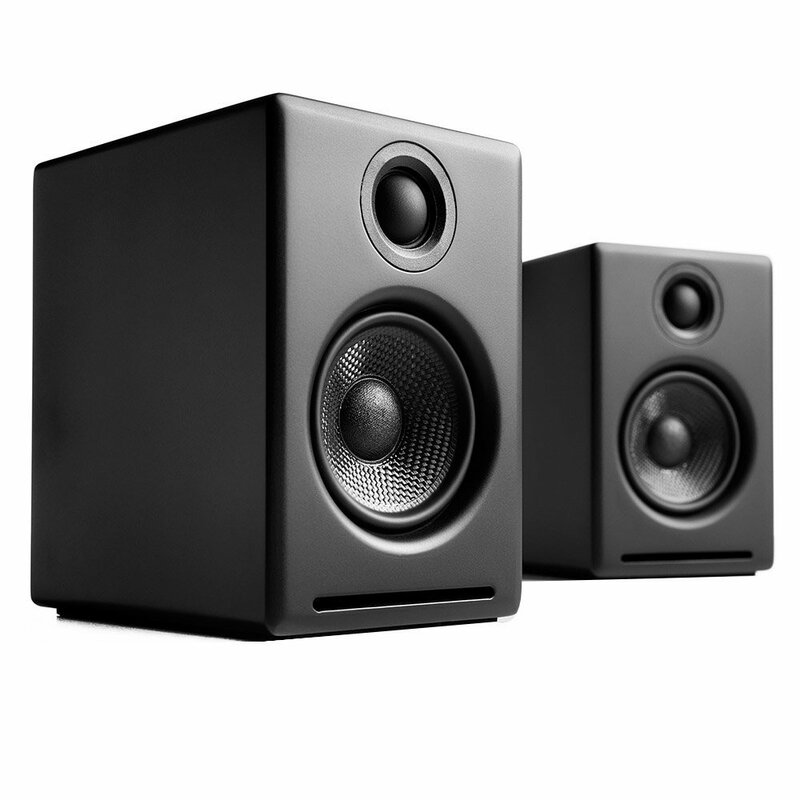 They may lack in the mid range and they reportedly tend to distort a tad at higher volumes, but one needs to bare in mind that these are in fact desktop speaker and not high end bookshelf monitors. The dimensions of the speakers are 3.9 x 7.1 x 2.8 inches, meaning they do not take up that much space on a desk. The right front speaker has the volume button and an aux jack, along with a conveniently concealed microphone. The Creative Inspire T12 are definitely for casual, non-fussy listeners who enjoy casual music listening at an incredibly affordable price. 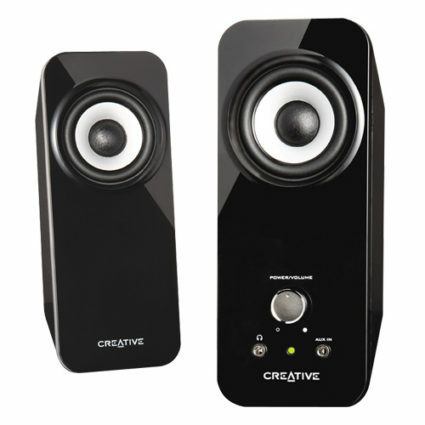 The Creative Inspire T12 give a lot for their price. They offer nice bass, a good overall sound and are neat and aesthetically pleasing. Their slight distortion at higher volumes may be a negative quality however. This is definitely a worthwhile buy however if you are looking for decent desktop speakers. 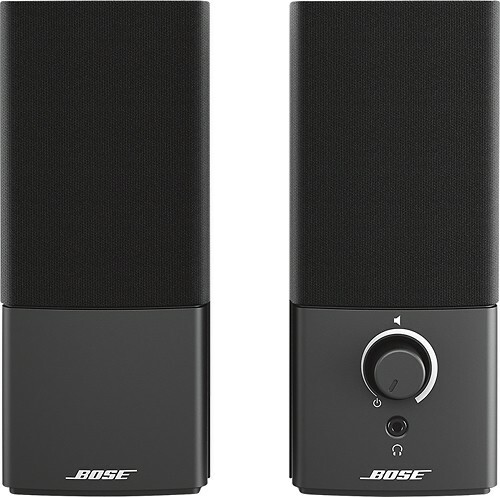 The Bose Companion 2 Series III computer speakers have a solid and durable black plastic design and are rather powerful for a 2.0 system. They are loud overall and do not distort according to user reviews, even at maximum volumes. They are said to deliver a strong bass for their size and a decent overall sound, although one user did find that they sounded like they had a reverb effect on, which therefore means they could possibly sound tinny. The aux cable is said to be slightly short, and annoyingly so for some. They product description does not specify how long the cable is, but users have suggested around 4 feet, while the cable that connects the two speakers is 6 feet. It switches on and off via its volume button and does not indicate whether it is on by way of an LED light, which is ideal for those looking to use them in the bedroom with a TV without being bothered by an ever present glow. It comes with a headphone jack for those looking to use headphones with them for discreet listening. The Bose Companion 2 Series III computer speakers have a strong bass and decent overall audio quality, however, those with a trained ear may find them to sound slightly tinny. 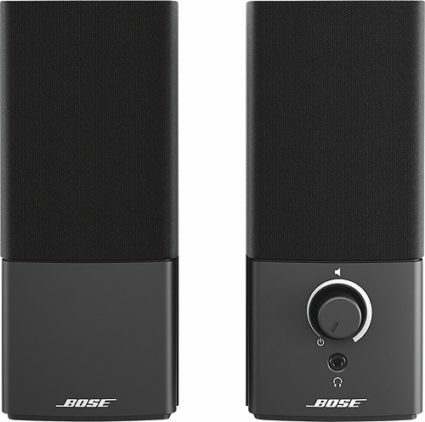 The Bose Companion 2 Series III offers decent overall sound with a strong bass for a 2.0 speaker system, but it may sound slightly tinny or like it has a reverb effect on for some. The Klipsch ProMedia 2.1 is a solid computer speaker system that has a truly clean sound. The speakers come with the Klipsch MicroTractrix Horn tweeter, which give a crisp, bright high frequency; while the 35-watt satellite speakers also deliver full-bodied stereo sound. The high end may be a tad bit too bright for some users, however. The 130-watt sub offers a clean, tight bass that really tops off the already well balanced mid and high frequencies. The entire system has a really nice design and the bass and volume buttons are conveniently placed on the front, making it easy to control the overall output. There is also a headphone jack incorporated into the 200-watt digital amplifier. The Klipsch ProMedia 2.1 is definitely well worth the price, as it offers a truly immersive listening experience. The Klipsch ProMedia 2.1 is an excellent choice for audiophiles, as this offer excellent sound quality across the entire frequency spectrum. It may be a bit pricey however, but you are definitely getting your moneys worth. 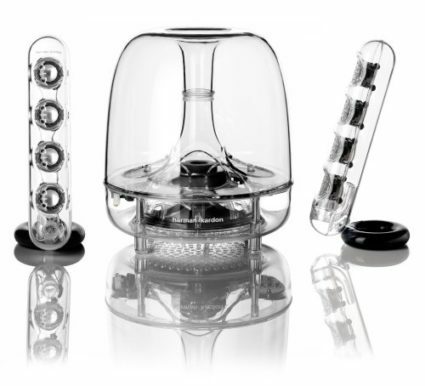 The Harman Kardon Soundsticks III have a great design. The transparent casing of the speakers along with the subwoofer, which looks like a jellyfish are really easy on the eyes. The satellites are adjustable and they give an overall nice sound quality with a nice crisp high end and mid range that has room for adjustment via an equalizer. The satellites have 4 x 1 inch transducers and the low-frequency is powered by a 20-watt 6 inch subwoofer that gives an excellent and accurate bass. As mentioned above, a user pointed out that it may lack some mid range frequencies, but he was easily able to fix this via a simple equalizer on his computer. Its touch volume controls makes it that much more appealing and doesn’t take away from the sleek industrial design in anyway. The Harman Kardon Soundsticks III is not only designed to look stylish, but is also built to deliver an excellent overall sound experience. The Harman Kardon Soundsticks III are excellent speaker that may lack some mid range detail (which can be adjusted via an equalizer), but their great design overall capabilities definitely make up for whatever they lack. 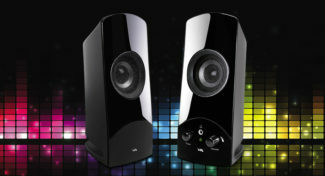 The Audioengine A2+ computer speakers are best used as nearfield computer speakers. They offer clarity and accurate audio reproduction in the mid and high frequency ranges, but seem to fall short when it comes to bass delivery, only going as low as 65 Hz. The speakers are small and compact and for this reason are more suited for smaller rooms, as you will be losing out on their already small soundstage. They have an integrated USB DAC and they come with a subwoofer output for those who are looking to buy an additional subwoofer, which will definitely be required by those who have a taste for extra bass. They are quite pricey compared to other computer speakers, but they do deliver a flatter response to other speakers, allowing for more accurate sound reproduction. Their maximum volume is a bit low, so if you do enjoy dangerously loud sound, you will need to look elsewhere. The Audioengine A2+ are perfect for smaller rooms or desktop listening, but a subwoofer will be required if you enjoy a lot of bass. 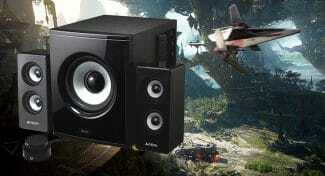 The Audioengine A2+ sound best when one is near to them as they are rather small, making these ideal for smaller rooms. The AmazonBasics Twins USB powered laptop speakers are convenient laptops speakers that offer a decent overall sound quality and are very easy to set up. 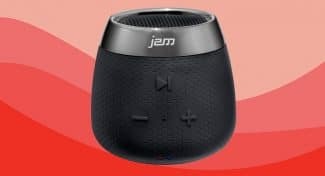 User have reported that they can sound a bit tinny, but the small but functional bass port located at the back of each speaker can warm things up a little. One can’t expect it to play at incredibly high volumes, as its total RMS power is 3-watt, meaning that it does pack some punch, but not as much as a proper 2.1 speaker system would. The overall tone can be improved with an equalizer, thereby adjusting any frequencies you are not fully happy with. User mentioned that they were good basic speakers and they were easily able to watch movies on them without being bothered by bad audio. The AmazonBasic Twins are well priced and convenient laptop speakers that are definitely able to satisfy the basic audio needs of users. the AmazonBasics Twins are very basic laptop speakers that will satisfy the most of sound requirement. 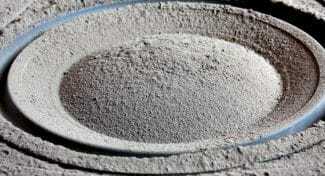 They are easy to use and hassle free. The Logitech USB powered laptop speakers offer a decent quality of sound, although they do lack on the low end, with the manufacturer listing that it is cut off under 90 Hz and its high frequency response goes up to 20 kHz. These speakers are great plug and lay speakers; they are easily set up and get to work as soon as laptop installs its drivers. Its total RMS power output is around 1.2-watts, making them better suited for an office or small room, as they will struggle in larger areas or noisy areas. The Logitech S150 are really affordable and if you are just looking for a small budget laptop system, these could definitely met your requirements. The Logitech S150 is a hassle free speaker that delivers a decent audio quality at a great price. The GOgroove Sonaverse TI is a pleasing looking USB powered 2.0 speaker system that is said to deliver a decent overall sound. Their portability was also a major plus for users, with a suggestion that these are perfect for presentations at the workplace. They put out 11-watt RMS, meaning they are decently loud, with the tower arrangement housing three speaker drivers that each separately deliver the highs, lows and mids. A notable complaint seems to be that the USB and audio cable need to plugged in quite closely together, as the wire is quite short. All-in-all, the GOgroove SonaVERSE TI USB powered speakers are great for offices and general small room listening. Also see our Best Wireless Portable Bluetooth Speakers for various other portable wireless speakers. 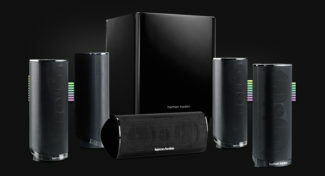 The Creative T15s are a clear and fairly accurate Bluetooth computer speaker system. 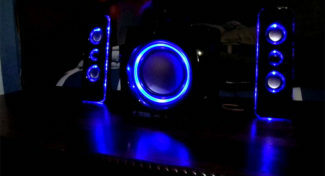 They are able to play music accurately in the mid and high frequencies, while offering just enough bass to satisfy most. The addition of the tweeters are what gives it most of its brightness, while the drivers deliver the warm mids and the large port tube the bass. These can connect via an auxiliary connection cable or simply enjoy them wireless via most Bluetooth enabled devices. 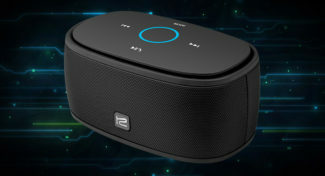 There were however reports of a slightly audible hiss that occurred only when connected via Bluetooth.The creatives T15 wireless computer speakers are definitely a worthwhile purchase, as their performance does seem to be pretty impeccable compared to other wireless computer speakers within its price range. 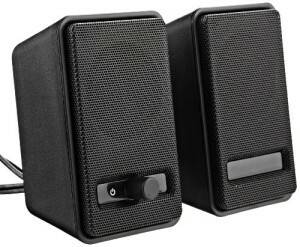 The Creative T15 2.0 speaker system is great for small room listening. They offer a great sound for both music and movies, but can give an audible hiss when played at lower volumes while connected to Bluetooth.